Seeeduino LoRaWAN is an Arduino development board with LoRaWan protocol embedded, through which you can get started quickly to experience LoRa's advantage in the field of IoT. 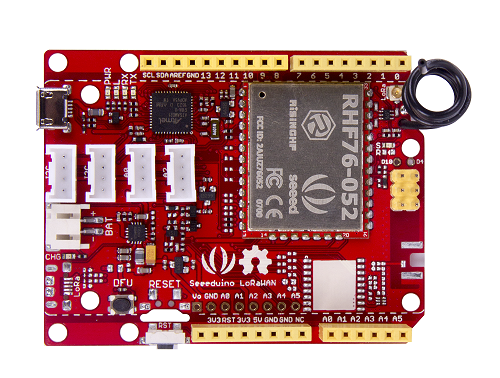 Based on the communication module RHF76-052AM, Seeeduino LoRaWAN is compatible with LoRaWAN Class A/C and supports a variety of communication frequencies. 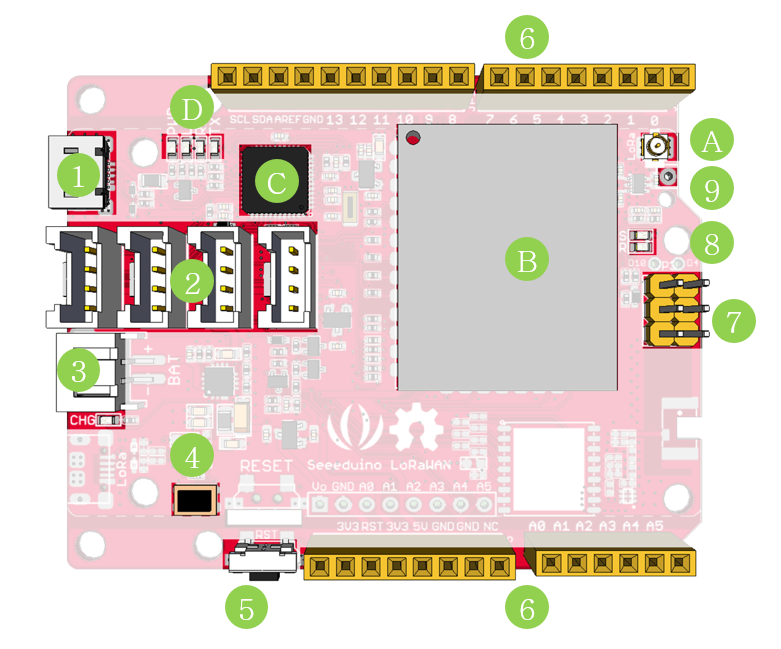 The 4 onboard standard Grove connectors allow Seeeduino LoRaWan to connect with hundreds of Grove sensors and actuators from Seeedstudio conveniently, as a result, users are able to be more focus on the application itself without worrying about the compatibility issue between different modules. In addition, the board has embedded an integrated lithium battery management chip that allows the board to be charged by USB interface. In low consumption mode, a full charged lithium battery can power the board for several months. If you want to build an IoT application quickly, Seeeduino LoRaWAN is your best choice. Please update the firmware when the first time to use it. Please always plug 3.7V Lipo battery in case USB power supply is not sufficient. Seeeduino LoRaWAN W/GPS is consist of GPS module. High link budget of 160dB. -140dBm sensitivity and 19dBm Output power. Unlike most Arduino & Genuino boards, the Zero runs at 3.3V. The maximum voltage that the I/O pins can tolerate is 3.3V. Applying voltages higher than 3.3V to any I/O pin could damage the board. There are 4 Grove connects on board. If this is your first time to hear about Grove, please put had on Grove System for more details. In brief, Groves is hundreds of sensor that in standard style, which is consist of sensors, actuators, displays as well as communication. If you want to use the 4 on-board Grove connector, please use digitalWrite(38, HIGH) to open VCC. Otherwise you can't provide power to Grove modules. 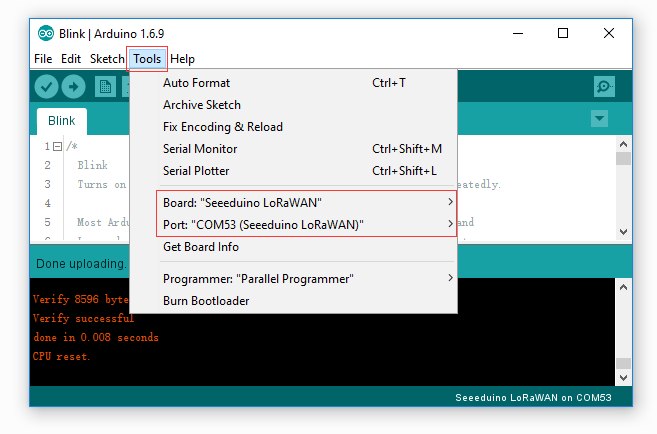 First you need to install the latest Arduino IDE, and ADD Seeeduino LoRa to your Arduino IDE. When the first time to insert the board, you should get a USB COM device name Seeeduino LoRaWAN that need to install a driver. Click on the below button to download driver for the board. 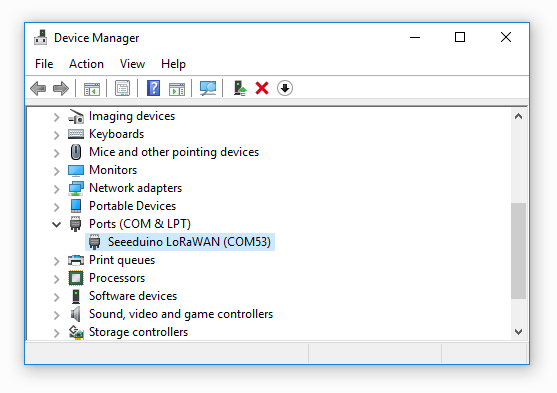 To make sure the driver was installed successful, open your Device Manager to see if Seeeduino LoRaWAN exists. 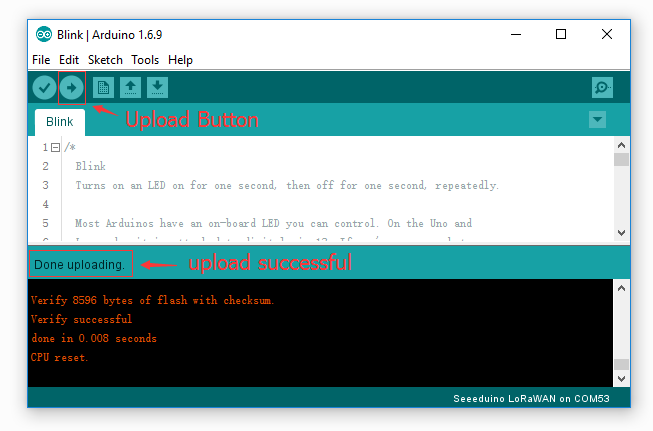 Now we can upload our first demo - Blink to Seeeduino LoRaWAN. Then click on the Upload button on the left-top of Arduino IDE, seconds later the sketch was uploaded successful. If the uploading is success, you should the some info in red and please the on-board LED, it's blinking. You can power the board via a 3.7V Lipo battery. There's a JST2.0 cable included, use it if you can't get a battery with JST2.0 connector. Make sure the positive and negative end of your battery is connected right, otherwise the board may be damaged. Charge status pin and positive pin of the battery had beed connect to A4 and A5, which allow you to detect the charge status and measure voltage of the battery via coding. Copy and upload the below code to detect the battery status. Charge status return 0 while charging, return 1 while charge done or no battery insert. You need 2 piece of Seeeduino LoRaWAN to complete this example, one for sending and another for receiving. Open your Arduino IDE and click on File > Examples > LoRaWAN > p2p_tx to open the sketch or you can copy the code below. This sketch will broadcast a string "Hello World!" every 3000 ms.
Open your Arduino IDe and click on File > Examples > LoRaWAN > p2p_rx to open the sketch or you can copy the code below. After both of the sketch is well uploaded, open the serial monitor of the receiving board, check if you can get some data as below. Step 1. Please refer to LoRa/LoRaWAN Gateway Kit to setup gateway first. Step 2. Connect the Grove-Temperature_and_Humidity_Sensor_Pro to D2 port of base shield. Step 3. Connect the base shield to Seeeduino Lorawan. Step 4. Download DHT Library and unzip to arduino library folder. Step 5. Copy below code to arduino IDE and upload. Step 6. 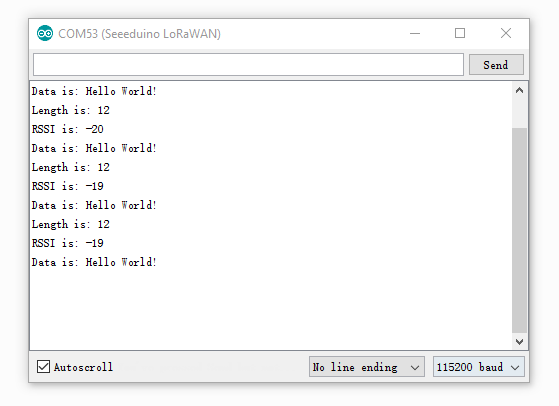 For local server, click Application->Seeed(the name of the Application you just added)->View application data, you will see the data you've just sent from the Seeeduino_LoRAWAN. For Loriot Server, go to Dashboard -> Applications -> SampleApp ->Device , click the Node Device EUI or DevAddr, you will find the data you've just sent here. Step 1. Please refer to User Manual Session 3.2.3 to setup the gateway. Step 2. 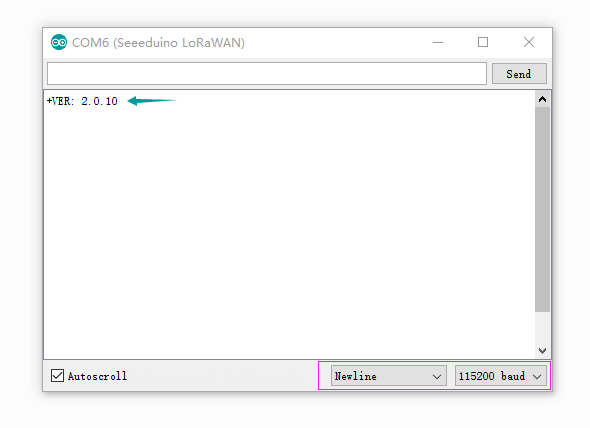 For seeeduino Lorawan, Please open your Arduino IDE and click on File > Examples > LoRaWAN > OTAA and refer the code. 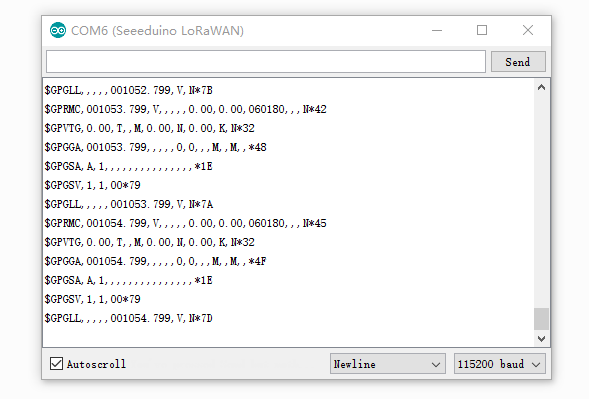 This chapter works with Seeeduino LoRaWAN W/GPS only. Step 1. Copy below code you Seeeduino LoRaWAN W/GPS. Step 2. Open Serial Monitor then you will get data from GPS. Thanks for Todd Krein for sharing the example in Github. 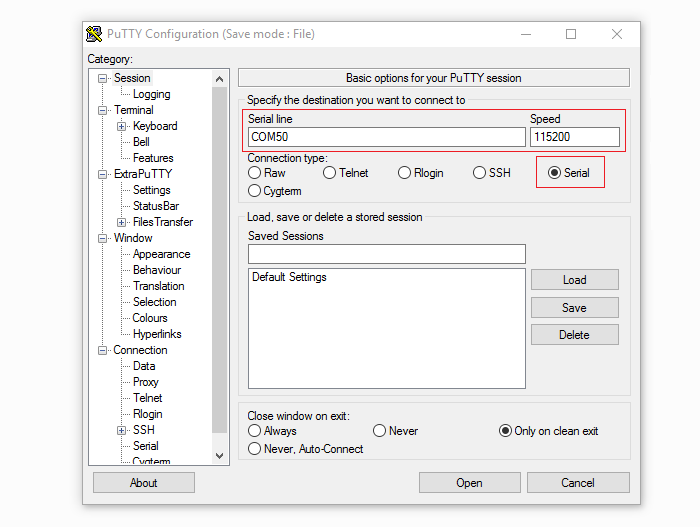 Please download the TinyGPS++ library and then copy below code to Seeeduino Lorawan. The minimum current is 80uA(for Seeeduino LoRaWAN) under our testing. Please follow below steps. Upload below code to your board. If you want to check version of you board, please upload below code to your board. Then you will get the version of your board. The firmware version of is 2.0.10, if you want to update firmware, few steps need to follow. Step 1. Copy and upload below code to your board. Step 2. Remove the board form USB and reconnect again, then press the DFU Button, after the Firmware mode led blinking you can go to the next step. Step 3. Click to download the latest firmware, which is a .bin file. Step 5. After connect your board to PuTTy successful, you will find the char 'C' print on the monitor continually. 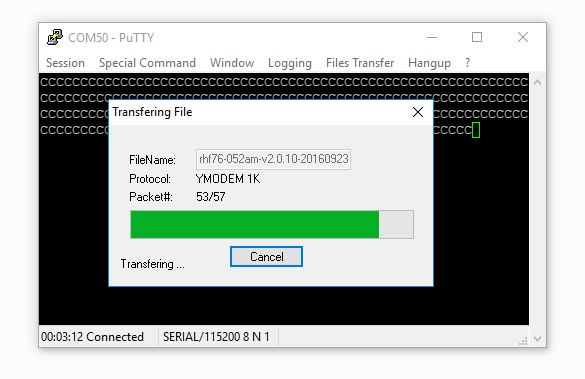 Click on Files Transfer > Ymodem > Send, and select the .bin file we had downloaded at Step4. Step 6. Then the updating is started. A1: Quickly double-tapping the reset buton to recover the board. LoRa IoTea: An automatic information collection system applied to tea plantation. It is part of intelligent agricultural information collection.